Is This the Beginning of the End of Climate Silence? Parts of Lower Manhattan are still underwater. Subway service is down indefinitely. New Jersey Governor Chris Christie said the Jersey Shore will never be the same. Analysts are putting Sandy’s cost at $50 billion, but that’s basically a wild guess. What’s perhaps the scariest thing of all is the idea that this could be the new normal in the United States. 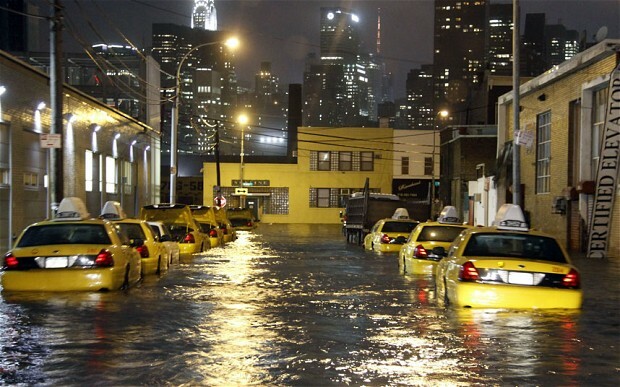 America will recover from Sandy, but can we afford more storms like this? I’d observed a couple of days before Sandy hit that climate change had disappeared from the campaign, but would surely be on the front burner when the rain stopped. It will be telling to see if either of the presidential candidates bring this up in the final days of the campaign. Elsewhere on the Network today: Copenhagenize says that Denmark’s 180 percent tax on driving is a policy that’s so widely accepted, locals barely notice. Bike Portland surveys Lower Manhattan following the storm and finds it devastated but surprisingly bikeable. And Bike Walk Lee highlights an all-too-common dispute between South Florida residents and FDOT over the agency’s myopic disregard for pedestrian safety. Who Should Foot the Bill for Sandy’s Damage to Tracks and Train Tunnels? As Another Major Storm Looms, Will Candidates Keep Ignoring Climate?